This is the first in a series of fifteen planned reviews of the films of John Flynn. During his 33-year career, Flynn directed everything from intimate character studies of volatile, potentially violent men to dark revenge films to early Steven Seagal vehicles and everything in between. Utilizing a spare style of filming that subscribed to the idea that the audience should not be aware of the director, Flynn placed an emphasis on strong performances and cleanly shot and edited action sequences that showcased impressive stunt work. His films show how a director with a clear vision can elevate even the most generic potboiler into a sturdy genre film worthy of rediscovery, yet most film buffs do not know his name. THE SERGEANT opens in 1944 as a platoon of American soldiers move cautiously through a densely wooded area in rural France. 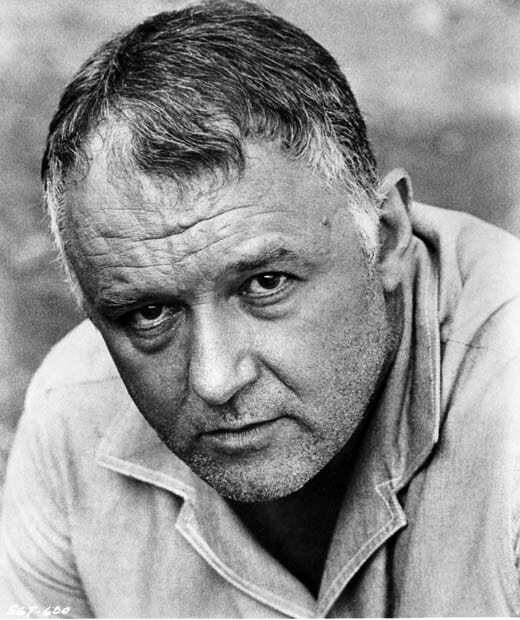 When German soldiers ambush the platoon, Master Sergeant Albert Callan (Rod Steiger) single-handedly takes out two machine gun nests, killing five German soldiers in the process. When he tries to shoot a sixth German soldier, he discovers that he is out of ammunition. The German runs through the forest and Callan gives chase, eventually catching up to him. The two men roll around on the ground, trying to get the upper hand. Eventually, Callan gets his arm around the soldier’s throat and applies pressure. He wraps his legs around the soldier from behind to keep from being kicked off as he chokes the life out of the man. When the soldier goes still, Callan rolls the man’s body over and collapses back, out of breath, a genuinely puzzled expression on his flushed face. It’s a hell of an opening scene and serves as a knowing setup for the story to come. The film then jumps ahead to 1952 as Callan returns to France, this time reporting for duty as the Master Sergeant of an Army company tasked with the job of supplying petroleum to other American forces still stationed in the country. The company is made up of a mix of military lifers and young draftees trying to complete their peacetime service as quietly as possible. Under the ineffectual command of Captain Loring (Frank Latimore), the company lacks the military discipline to which Callan obviously adheres. It doesn’t take long for Callan to take control of the company as Loring is only too happy to hand over day-to-day operations. Callan’s first order of business is to pull unassuming Private Tom Swanson (John Phillip Law) from his physical labor duty and make him the new company clerk. At first Swanson is resistant to the idea. He explains to Callan that there are other men in the company better suited for the job and that he prefers his current duty. What he does not say—and is implied through Swanson’s uncomfortable face—is that he does not relish the idea of working so closely with Callan. But it does not take Callan long to bully Swanson into accepting the assignment. Once Callan has Swanson under his thumb, the film becomes a masterpiece of squirming suspense. The screenplay by Dennis Murphy (adapting his own novel) clearly presents Callan’s interest in Swanson as more than professional. He makes casual compliments to Swanson about his physique and good looks, praises his intellect, and encourages him to go to college after his stint in the Army is complete. At the same time, he tries to sabotage Swanson’s romance with a French woman who lives in the nearby town and attempts to turn the young Private into his drinking buddy with passive-aggressive displays of drunken horseplay that threaten to turn violent at a moment’s notice. THE SERGEANT was released in 1968. While the nation was in the midst of upheaval, gay characters were still far from the mainstream. Modern viewers may look at Callan’s thinly-veiled pursuit of Swanson and find it lacks subtlety. 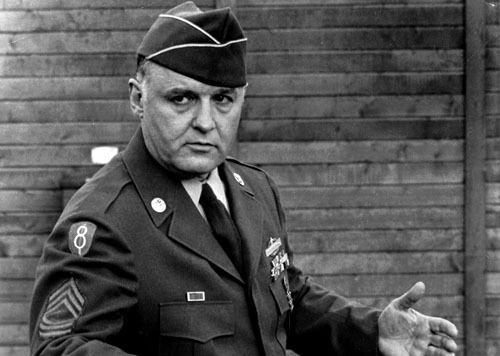 But what you have to remember is that this film was produced and released by Warner Bros. and was Rod Steiger’s follow-up to his Oscar-winning turn in IN THE HEAT OF THE NIGHT. The idea of a career military man battling against his repressed homosexuality probably never entered the minds of most viewers until a riveting third act scene when Callan finally breaks down and admits to himself—and a stunned Swanson—who he is and what he wants. Even without its ahead-of-its-time handling of tricky subject matter, the film holds up extremely well. Most of the credit goes to Steiger’s surprisingly restrained performance. While Callan’s initial address to his new company is vintage, over-the-top, furious Steiger shouting at the top of his lungs, for most of the film he simply simmers. Callan is a man who is frightening in his stillness. He makes it clear through a glance, a sarcastic smirk or chuckle, and muttered asides when he is unhappy with something. Steiger understands that if Callan keeps barking, he will become a joke—a parody of himself. Instead, his Callan treats the men (including the flustered Captain Loring) with casual condescension, leaving them to always wonder if they are on the verge of setting off his temper. Steiger’s performance operates on the audience in the same way. We recognize that he is a dangerous man—not because of his sexual orientation—but because of what repressing his sexuality has done to his psyche. While not a large man, Steiger is an imposing physical presence. He uses that presence to serve as a ticking time bomb. The characters in the film may fear that Callan will explode at any moment, but the audience knows he will. Steiger uses that knowledge to his advantage. He builds his performance in small increments, allowing just a little bit of steam out in small moments so that he can increase his controlled intensity to even greater heights without it seeming ridiculous. His relative restraint through most of the movie makes his third act breakdown that much more frightening and devastating. While his role is rather thankless, Law does a fine job as the affable Swanson. He comes across as a decent, if somewhat bland, young man caught in a situation he does not quite understand. At the same time, he manages to keep from getting completely blown out of the water by Steiger in every scene. The only other film from which I can recall Law is Mario Bava’s DANGER: DIABOLIK, in which he played the titular comic book outlaw. 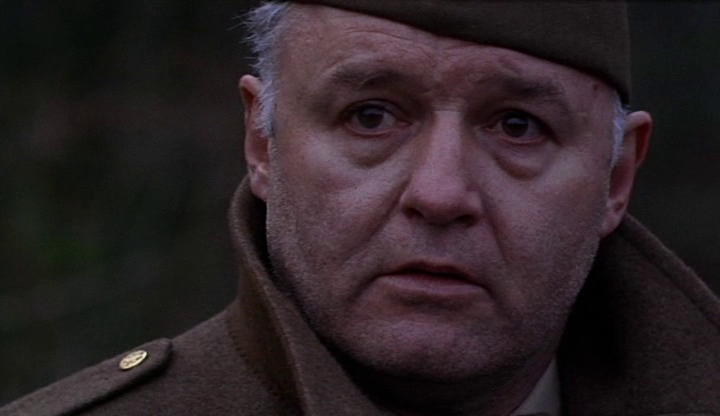 That film, while thoroughly entertaining, required much less of him than THE SERGEANT, so it was a bit of a surprise to see him so adept at heavy drama. For the film to fully work, the audience has to like Swanson, and Law is a big reason that the character is as appealing as he is. As a directorial debut, THE SERGEANT showcases a lot of what would make Flynn a successful filmmaker through his career: strong acting, skillful pacing, an almost tactile sense of atmosphere, and sharp editing. Flynn and editor Françoise Diot use Steiger’s performance to pace the film, turning it into the definition of a slow burn. But that is not to imply that the film is ever dull. Every moment pushes the plot forward and seemingly throwaway shots or sequences are used to later build suspenseful sequences. Even when the film slows down to take in the sense of a nation emerging from the still recent pain of World War II (Flynn shot the entire film in France), these scenes serve the purpose of establishing an almost alien backdrop to the story. Flynn and cinematographer Henri Persin keep the look of the film fairly low key, stressing shadows, subtle camera movements, and close ups over anything too flashy. But like Steiger, they choose key moments to showcase an unexpected flourish. These moments (stark black and white photography for the opening battle scene, a breathtaking overhead crane shot of Callan late in the film) are used to give even more punch to the few visceral moments in the script without ever feeling manipulative. Even though it was produced and released in the late ‘60s, THE SERGEANT feels like the kind of uncompromising, cynical character studies that ambitious filmmakers would craft in the ‘70s. It presents a difficult character and offers audiences no guidance in how to see them, forcing the viewer to think and actively watch, rather than spoon-feeding an easily digestible narrative. Is Callan a heroic soldier tragically undone by sexual repression? Is he a sexual predator in a position of power threatening to destroy a young man’s life? Is the truth somewhere in between? Flynn never draws a clear line and the film is all the richer for it. Prev LITTLE MISS RISK’S TOP 5 SCI-FI MUSIC VIDEOS!